Director – Jon Turteltaub, Screenplay – Gerald Di Pego, Suggested by the Novel Ishmael by Daniel Quinn, Producers – Barbara Boyle & Michael Taylor, Photography – Philippe Rousselot, Music – Danny Elfman, Visual Effects – DreamQuest Images (Supervisor – Jeffrey Burks), Special Effects Supervisor – James I. Roberts, Character Effects – Stan Winston Studio (Supervisor – Stan Winston), Production Design – Garreth Stover, Primate Choreographer – Peter Elliott. Production Company – Touchstone/Spyglass Entertainment. Theo Caulder, an ambitious young psychologist at the University of Miami, pushes to receive the assignment of assessing anthropologist Ethan Powell. Deported from Rwanda for the murder of several park rangers, Powell has been incarcerated in the criminally insane wing of the Harmony Bay prison after attacking several federal officers during transit. Caulder is certain that he can get the wilfully silent Powell to speak. He eventually succeeds in doing so. Powell tells Caulder the story of how, while observing silverback gorillas, he was eventually accepted and then lived amongst them as a wild man until the senseless murder of the apes by Rwandans drove him to violence. In coming to understand Powell’s throwing off the shackles of civilization, Caulder is inspired to make a stand against the inhumane treatment of the prisoners at Harmony Bay. The poster for Instinct tried to sell it as another The Silence of the Lambs (1991). With its horror-evocative title and the face of Anthony Hopkins in wild man mode filling the poster, Instinct seemed designed for maximum identification with The Silence of the Lambs. Ditto the trailer, which edited together carefully selected scenes of the confrontations between Cuba Gooding and Anthony Hopkins and many of the ape flashbacks to suggest this was another journey-into-the-mind-of-a-genius-serial-killer film. However, when one sits down to watch Instinct, all of this proves to be a massive cheat. The film certainly starts out in the vein of The Silence of the Lambs with the trainee entering the dark prison lair to get inside the head of the crazed Anthony Hopkins. 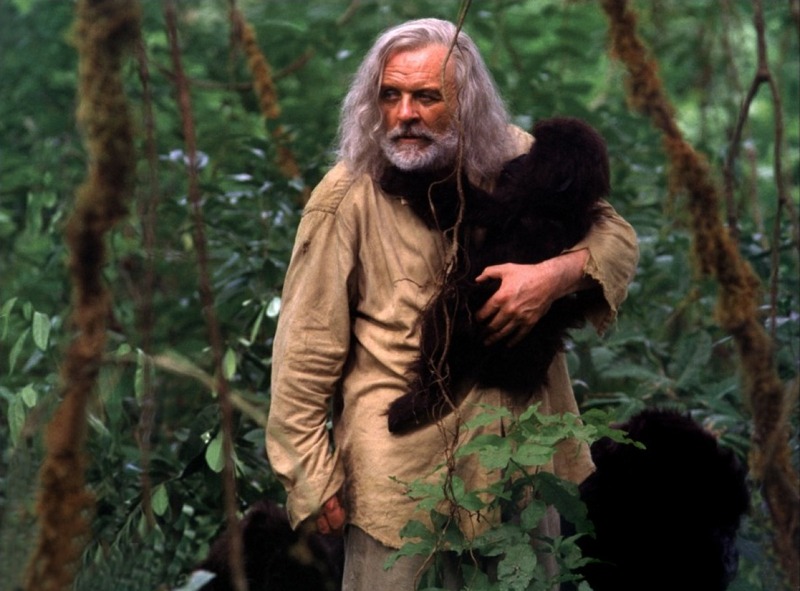 In surely one of the strangest series of doglegs any film has taken, what starts out as a serial killer thriller then unfolds into a variant on Gorillas in the Mist: The Story of Dian Fossey (1990) as it explores Anthony Hopkins’s past as an ape anthropologist. It then takes a further dogleg and becomes a rebel-takes-a-lone-stance-against-a-corrupt-penal-institution film of which it has substantially borrowed from both One Flew Over the Cuckoo’s Nest (1975) and The Shawshank Redemption (1994). In fact, what starts out as a Silence of the Lambs clone ends up bizarrely inverting itself to the point where the imprisoned killer turns out to be someone whose purpose concludes in giving the investigating psychologist a trite positive thinking message about standing up against the system. By the end, Instinct is not even a horror film, even though the film has been pitched to this genre. Director Jon Turteltaub has assembled a good cast. 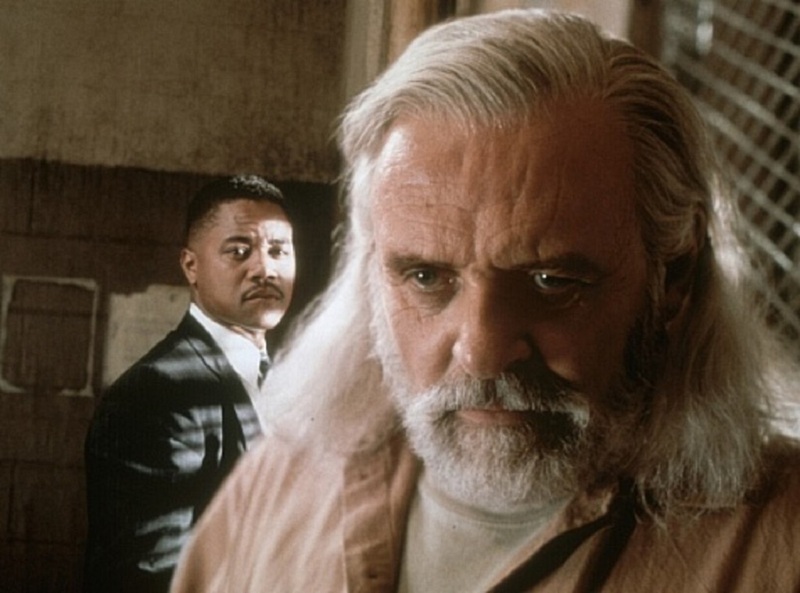 Anthony Hopkins rises to expected form and Cuba Gooding Jr provides a lively nemesis. The muchly underrated Maura Tierney does what she does well – projecting a plaintively honest strength. Stan Winston turns in some incredibly convincing apes. Jon Turteltaub has a fair ability to get inside a scene and draw out its emotional strength and he makes the confrontations between Cuba Gooding Jr and Anthony Hopkins work well. Turteltaub’s downside is that his films end up making a good deal out of simplistic emotional homilies. Here the film makes an absurd analogy between the poaching of endangered species and the need for one person to live outside institutional conformity. Moreover, the way that Turteltaub characterises the people inside the prison draws on simplistic cliches – that of good underdog prisoners and cruel and sadistic guards – in the worst ways. It is a cue the film seems to have taken directly from the same (although more sophisticatedly presented) dialectic in One Flew Over the Cuckoo’s Nest. Unfortunately, the idea of representing a prison wing of criminally insane killers and sexual offenders as child-like innocents and underdogs feels like a dangerous misconception. Jon Turteltaub had begun directing with 3 Ninjas (1992), Cool Runnings (1993) and While You Were Sleeping (1995), all of which are films pitched at easy box-office appeal. Turteltaub’s biggest success was the action film National Treasure (2004) and its sequel National Treasure: Book of Secrets (2007). Within the genre, Jon Turteltaub had previously made Phenomenon (1996) with John Travolta as a man who gains expanded mental abilities, the Disney fantasy film The Kid (2000) with Bruce Willis meeting his childhood self, The Sorcerer’s Apprentice (2010) and the killer shark film The Meg (2018). Turteltaub has also executive produced and directed some of the post-holocaust tv series Jericho (2006-8) and the horror series Harper’s Island (2009-10). (Winner for Best Makeup Effects at this site’s Best of 1999 Awards).